The major radiation of archosaurs in the Mid- to Late Triassic, marked by the split of the Crurotarsi and the Ornithodira (see pp. 138-45), provided a starting point for the radiation of the dinosaurs. The oldest dinosaurs date from the earliest Late Triassic (mid-Carnian), although their sister group, Marasuchus, is latest Mid-Triassic in age, which implies an origin of dinosaurs at least by that time. The dinosaurs radiated dramatically during the last 20 Myr of the Triassic, the Norian Stage, and there has been a heated debate about how this happened, whether by successful competition with the synapsids, the basal archosaurs and the rhyn-chosaurs, or by opportunistic radiation after an extinction event. An understanding of the origin of the dinosaurs must start with a study of the earliest ornithodirans. The closest major outgroup of the dinosaurs may be the pterosaurs (see Box 6.1). This may seem an unusual pairing, but Gauthier (1986) noted similarities between the two groups, particularly in the hindlimb. For example, the ankle joint is simplified to a hinge-like arrangement in which the astragalus and calcaneum act together as a kind of'roller', and the middle three toes are elongated and held in an upright position so that the animal stands up on its toes, the digitigrade posture. Pterosaurs are discussed in more detail later (see pp. 224-9). Pterosaurs and dinosauromorphs together are termed the Ornithodira. A small reptile from the Upper Triassic of Elgin, Scleromochlus (Figure 6.8(a, b)), appears to be an out-group to Ornithodira, the basal member of the di nosaur branch of archosaurian evolution, termed the Avemetatarsalia (see Box 6.1). Scleromochlus has the bird-like features of a tibia that is longer than the femur, an adaptation seen in some running animals, and a closely bunched group of four elongate metatarsals. It lacks the elongate neck, reduced fibula and the simplified ankle joint (astragalus and calcaneum closely attached to each other and to the tibia) seen in or-nithodirans. Scleromochlus has sometimes been allied with Pterosauria (Sereno, 1991), but it appears more firmly located in the phylogeny at the base of Avemetatarsalia (Benton, 1999a). This slender little reptile was only 170 mm long, the size of a blackbird, and it was certainly bipedal—its forelimbs are very much shorter than its hindlimbs. It had been interpreted as a a climber or even a glider and hence in some way ancestral to pterosaurs. Scleromochlus might even have been able to hop: it has the proportions of the desert-living jerboa, a small mammal that leaps around the sand dunes of North Africa at night. Two small reptiles from the Mid-Triassic of Argentina fall closer to the dinosaurs than to the pterosaurs, Lagerpeton and Marasuchus. Lagerpeton is incompletely known, but is a basal dinosauromorph, whereas Marasuchus (Sereno and Arcucci, 1994) is a basal dinosauriform (see Box 6.1), characterized by a number of shared characters (Sereno, 1991), such as: a 'swan-neck' in which the cervical vertebrae follow a strongly S-shaped curve, a forelimb less than half the length of the hindlimb, a much reduced calcaneum that is one-third or less of the size of the astragalus and further specialized features of the foot. for grappling with prey and for passing food to its mouth. Older accounts frequently state that dinosaurs arose early in the Triassic and evidence in the form of skeletons and footprints is often quoted. 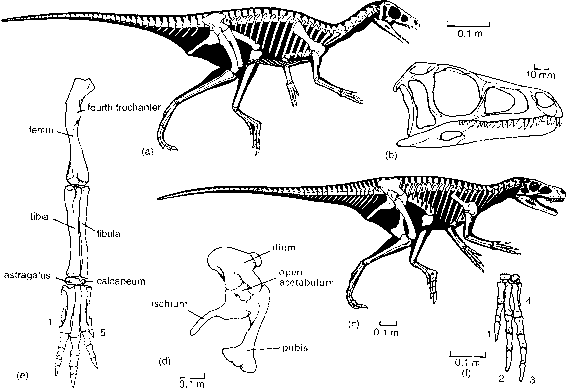 The supposed skeletal remains of dinosaurs from before the Late Tri-assic turn out, though, to belong to prolacertiforms, rauisuchians and other non-dinosaurian groups (Wild, 1973; Benton, 1986a, 1994). Dinosaur footprints, generally showing three toes and no heels, because of their digitigrade posture and the reduction of toes 1 and 5, had also been recorded from the Lower and Mid-Triassic of various parts of the world, but critical reexamination (Thulborn, 1990; King and Benton, 1996) shows that they have been wrongly identified. The oldest true dinosaurs are known from the early part of the Late Triassic (the Carnian Stage, 230-220 Myr ago) from various parts of the world. The best specimens come from the Ischigualasto Formation of Argentina, source also of the rauisuchid Saurosuchus (see p. 141). The Ischigualasto dinosaurs, Eoraptor and Herrerasaurus, are relatively well known from nearly complete specimens and they give an insight into the days before the dinosaurs rose to prominence. 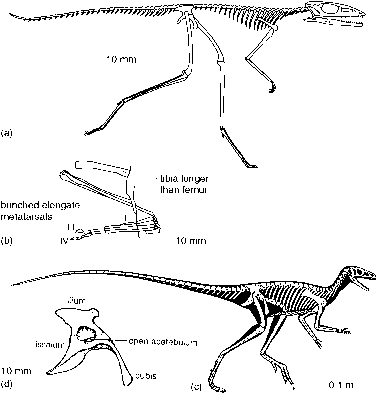 Eoraptor (Sereno et al., 1993) is a lightweight animal 1m long (Figure 6.9(a)), with a number of dinosaurian characters: the postfrontal is absent, there are three vertebrae in the sacrum, the deltopectoral crest runs a long way down the shaft of the humerus, the femur is modified for fully erect posture and there are various dinosaurian characters in the ankle, including an ascending process on the astragalus. shows a number synapomorphies of the Dinosauria, features that are not seen in Marasuchus or the pterosaurs: the acetabulum is fully open (Figure 6.9(d)) and the head of the femur is bent inwards (Figure 6.9(e)). Herrerasaurus has a short arm and a strong hand (Figure 6.9(f)) with three functional fingers (digits 4 and 5 are reduced to small bone splints), which it probably used for grasping and raking food. Both Eoraptor and Herrerasaurus were initially classed (Sereno and Novas, 1992; Sereno et al., 1993) as basal theropods, although they may turn out either to be basal saurischians or even basal dinosaurs (Langer et al., 1999; see Box 8.5). At one time, most palaeontologists regarded the di nosaurs as a diverse assemblage of archosaurs that arose from several ancestors—a polyphyletic group. Cladistic analyses (e.g. Gauthier, 1986; Benton and Clark, 1988; Sereno, 1991) have indicated, however, that the Dinosauria is a monophyletic group, characterized by many features (see Box 6.1). Other Carnian dinosaurs include basal ornithischians and basal sauropodomorphs (Langer et al., 1999), but they, Eo-raptor and Herrerasaurus, were only rare elements in their faunas (1-3% of all skeletons). Before the end of the Triassic, however, the dinosaurs had radiated widely to become the most abundant vertebrates on land. How did this happen? 6.4.3 Radiation of the dinosaurs—competition or mass extinction? There are currently two ways of viewing the radiation of the dinosaurs in the Late Triassic. Either they radiated opportunistically after a mass extinction event, or they competed over a longer time-span with the synapsids, rhynchosaurs and basal archosaurs, and eventually prevailed. Until recently, most authors (e.g. Bakker, 1972; Charig, 1984) favoured the competitive model for four reasons. First, as mentioned above, many considered that the dinosaurs were a polyphyletic assemblage and hence that dinosaurs arose several times as a result of similar competitive pressures. Second, the origin of the dinosaurs was seen as a drawn-out affair that started early in the Mid-Triassic and involved extensive and long-term competition (Figure 6.10). The dinosaur ancestors were regarded as superior animals, with advanced locomotory adaptations (erect gait) or physiological advances (warm-bloodedness, or coldbloodedness: both cases have been argued!) that progressively competed with, and caused the extinction of, all of the synapsids and basal archosaurs. Third, the appearance of the dinosaurs has often been regarded as a great leap forward in evolutionary terms. Fig. 6.10 The expansion of the dinosaurs in two phases: (1) sauropodomorphs expanded in abundance and diversity at the beginning of the Norian, after the extinction of dominant herbivore groups (rhynchosaurs, dicynodonts, chiniquodontid cynodonts); (2) theropods diversified, with the appearance of large species, after the extinction of phytosaurs and 'rauisuchians' at the end of the Triassic. The end-Carnian and end-Triassic extinction events are indicated. than dinosaurs and dinosaurs might be better than their forerunners. This assumption of progress has never been demonstrated (Benton, 1987), and indeed the major changes in world floras and faunas might equally well be associated with expansions into new ecospace, involving no direct competition with pre-existing forms at all. Several lines of evidence (Benton 1983a, 1986a, 1994) suggest that the dinosaurs radiated after ecospace had been cleared during the end-Carnian extinction event (Figure 6.10) and that the dinosaurs did not establish their pre-eminence after a long period of competition with precursor groups. 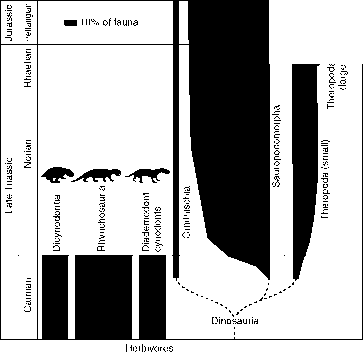 1 The fossil record does not show a gradual take-over, but two rapid expansions after extinction events. The first dinosaurs in the Carnian were rare (1-3% of individuals). An extinction event at the end of the Carnian saw the disappearance of all dominant herbivore groups—the dicynodonts, herbivorous cynodonts and rhynchosaurs. Herbivorous dinosaurs then radiated seemingly rapidly in the early Norian, rising to 50-90% of individuals. Dinosaurs diversified further in the Early Jurassic after a second mass extinction at the very end of the Triassic when the remaining basal archosaurs and other groups died out. 2 The first dinosaurs had the key characters that assured their later success, but they did not take over at once (Sereno, 1999). During the Carnian, all three major dinosaurian lineages were present,but theropods and sauropodomorphs did not radiate for some 5-10 Myr after their origin, and ornithischians 20-25 Myr later, in the Early Jurassic. 3 The 'superior adaptations' of dinosaurs were probably not so profound as was once thought. Many other archosaurs also evolved erect gait in the Late Triassic, and yet they died out (e.g. aetosaurs, rauisuchians, ornithosuchids and some early crocodylomorphs). 4 There were other extinctions at the end of the Carnian. The Dicroidium flora of the southern hemisphere gave way to a worldwide conifer flora about this time (see p. 138). There were turnovers in marine communities, particularly in reefs, and there was a shift from pluvial (heavy rainfall) climates to arid climates throughout much of the world (Simms and Ruffell, 1990). The climatic and floral changes may have caused the extinctions of the dominant herbivorous tetrapods. 5 The idea that simple competition can drive the replacement of one major group by another is an oversimplification. Competition between families or orders of animals is very different from the ecological observation of competition within or between species. In palaeontological examples such as this, competition has often been assumed to have been the mechanism, but the evidence has generally been shown to be weak (Benton, 1987). This kind of macroevolutionary debate is hard to set out in clearly testable form. Many palaeontologists would prefer not to investigate such questions, regarding them as story-telling of the worst sort. Intelligent people are bound to ask questions about major events, whether mass extinctions or evolutionary replacements; it would be unsatisfactory simply to say 'we do not know, and never will'. And, as the quality of our understanding of the fossil record improves (more fossils, better dating, better geographical coverage), it is possible to home in on events and dissect them in increasing detail.